This week grassroots leaders just like you from across Alabama and the nation are taking a stand against right-wing attacks on voting rights, worker rights and immigrant rights by marching in the footsteps of the 1965 Voting Rights Marches from Selma to Montgomery. They’re sick and tired of laws that scapegoat immigrants, that diminish workers’ rights to organize, and that claw back basic voting rights that were won through the sacrifice of thousands of heroes so many years ago. What began in Wisconsin a year ago has reached the Deep South. And the people are taking a stand. 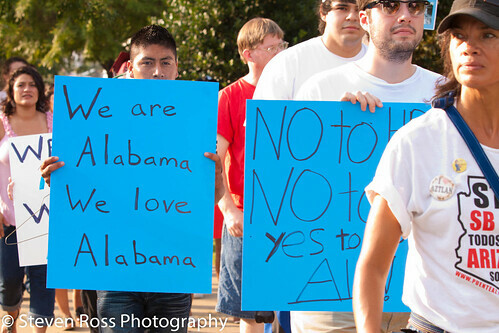 On Thursday, March 8th, hundreds of workers, community members and immigrants from Alabama and across the country will march into Montgomery, AL and gather at St. Jude’s Catholic Church for a rally to call for the repeal of Alabama’s harsh anti-immigrant law, HB56. Let’s greet them at 6 PM and add our voices to theirs in the fight for basic human and worker rights. On Friday, March 9th, thousands of leaders will begin the final 4-mile leg of this 54-mile journey at St. Jude’s at 9 AM and will walk to the Alabama State Capital in Montgomery, AL across from the historic Dexter Avenue Baptist Church calling for a renewal of the progressive movement and unity across the labor, civil rights, and immigrant rights movements.